Here we go, the number one, most requested gift guide for the holiday season is ready and waiting for you! After my latest Instagram poll, it's clear that I'm not the only one who thinks that the grandparents are impossible to buy for. Is there anything more classic than a baby handprint smooshed into a salt dough circle and hung on the tree? We make one of these every year (until there isn't enough dough to go around) and etch the date on each one. 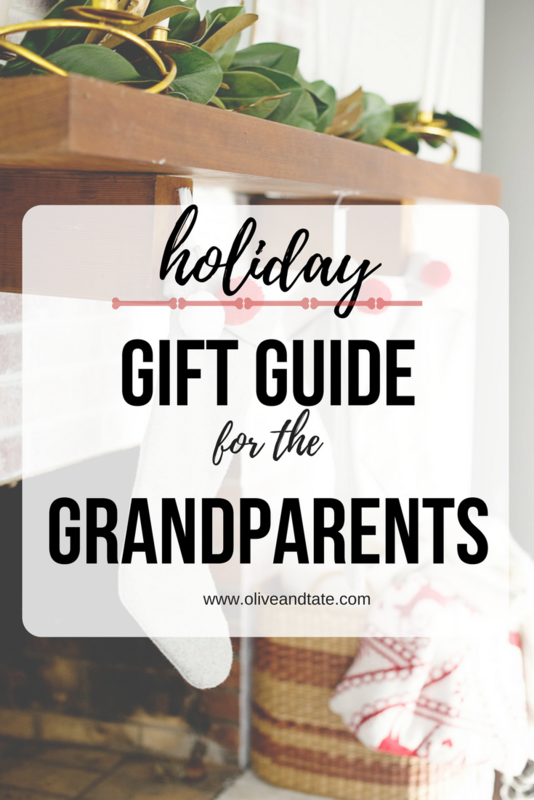 My kids feel proud that they helped make the perfect gift for their grandparents and the adults love the sentimental touch. This kit is a whopping $8 and Amazon Prime eligible so go ahead and get it - you'll be glad that you did! Tip: this is a perfect activity to take to Grandma's house if you're traveling for the holidays. 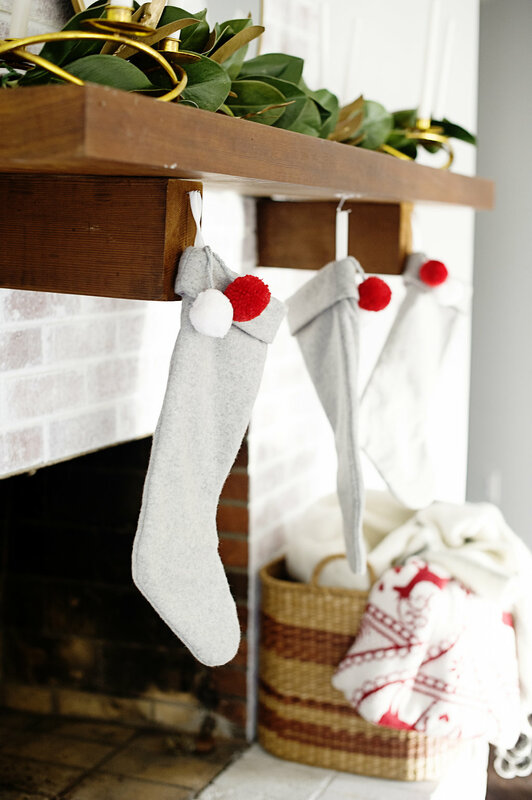 Make them on Christmas Eve as a family and hang them on the tree together on Christmas morning. From my favorite jewelry maker, this is the perfect necklace for a Grandmother or Grandmother-to-be. Add a initial charm tag for each grand baby as your family grows and you can check her holiday gift off the list any year one of your siblings has a babe! This is one of the most unique and sentimental items on the list (and what I'm getting my own mother for Christmas, so don't look, Mom!) and I couldn't love it more. Minted will take a handwritten recipe and turn it into a foil art print, complete with your choice of frame style. My grandmother is no longer with us and I cannot imagine how special it will be to have her handwritten recipe for one of her classic dishes preserved, framed and on display in my paren't home. I'm lucky to have recipes written down thanks to this all-time-best-ever-gift from my Mom, and now I can return the favor. A fresh take on the classic photo coffee mug, I love the shape and and style of this Latte mug! For the Grandpa who golfs, personalized golf balls are the cutest! Add a photo of grandpa and kids on the golf course, a message, date or special saying and you're good to go. My husband would like you all to know that golf balls come in all levels of quality so check with a golfer before you invest in a ton of personalized balls. The perfect gift for grandparents celebrating a new grand baby at the holidays, this silver baby shoe can be engraved on the bottom with baby's name and special details and has a heart charm that displays the year. Can you imagine anything sweeter than a photo of all of the grandkids together on an engraved gold charm necklace? If the grandchildren are spread across the county, have the techy person in your family photoshop all of their faces together into one image and voila! I can't think of a Grandmother who wouldn't love that. You could also do a photo of the grandparents on their wedding day for an extremely sentimental, non kiddo related gift. This is what we gifted both sets of grandparents last year and I was so, so happy with our silhouettes! You can see our end result here but the process is so easy - you just snap a photo (on your phone! ), upload to Minted and they "cut" the silhouette for you. Once you approve the silhouette, you can choose the color, personalization and even have it framed. The entire process took less than two weeks for us, even though it was during peak gifting season, and I was able to style two different prints to match each family's home decor. I honestly want one for myself! How sweet is this for a non-traditional portrait option? Bonus: you can have a second print of your original water color made for $25 - so you have both families covered! I love this custom watercolor home ornament for both sets of grandparents and for different reasons! My parents have lived in the same house for 20 years and having a watercolor of the home they raised their children in would be so special. On the flip side, my in-laws have moved quite a bit and have made each and every house a home - wouldn't it be fun to dig through old photos and gift them a watercolor ornament of each home they've lived in? I could space them out over a few years, guaranteeing perfect gifts for the foreseeable future! So, my parents got an iPad for one reason only: to FaceTime with my offspring. With that in mind, I can't think of a better gift for them than a personalized photo collage iPad cover. It will keep their iPad safe and show them the faces of their favorite people (my children) even when we aren't available to FaceTime. For the handy-man Grandpa, I love this personalized hammer! Engrave it with a favorite project completed together or "Property Of Papa" so his neighbors always know where to return it after they borrow, I think this solves the "what to get Grandpa" dilema. Justin and I have gifted all 4 of our parents with a set of Ugg slippers and they were a hit each time. The quality is amazing, they hold up well, you can choose an option with a sole if needed and it's a gift that many wouldn't splurge on for themselves. My in-laws's rescue pup is their new baby and they are head over heels in love with him. Last year we gifted them with a silhouette of our son and I think it's only fitting that this year they receive a matching one with their gorgeous Golden Retriever's profile on display. Minted allows you to choose the color of the silhouette, the personalization and the frame - and the results are super high quality. Get ready for your close up, Crockett! Because the classic "World's Best Grandpa" coffee mug can't fit in cup holders for that commute to work (or the road trip to the grandkid's house!) this stainless steel version is a must. Cover it with pictures of the babes and you're all set! Don't take this the wrong way, Grandparents, but you aren't always known to be the best with technology. My Mom is always asking me how she can get a picture that I published on my blog or sent her via text, and she doesn't mean she wants to save it to her iPhone camera roll. This tiny photo printer has insanely good reviews, is less than $130 and prints color photos via BlueTooth. Girl, these are awesome ideas. I actually woke up this morning thinking about Christmas gifts. I usually bring goodies from Hawaii but that gets kind of old after a while. Definitely going to look into some more meaningful gifts that include the grandkids in them. Thank you!